Every coat needs to take heed from this furry number. When I ordered it, I though it'd be more of a shearling-type fabric. But it's actually short faux fur on the inside. Oh my is it warm! There should be a rule to make every coat fur lined. Offttt. That'd be heavenly. 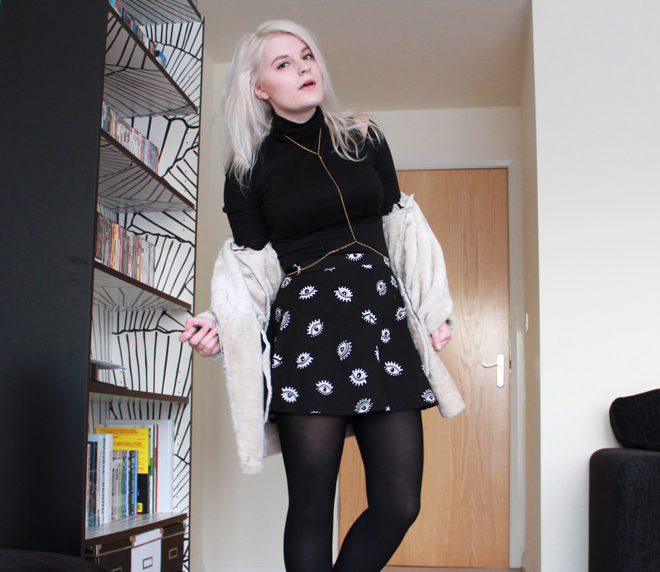 I'm totally obsessed with this polo neck top at the mo - craving more neck hugging items now! It was a total eBay barg that I bought last year and completely forgot about. It's actually meant to be a dress, but at a mighty 5ft 4 it fits me as a top after washing it at 40 (IS THAT SUCH A CRIME?!). Guess I'll remember to wash it at 30 next time or it might turn into a turtle neck thimble or something. I've also been featured on ASOS Fashion Finder here in the partywear to daywear style challenge along with Carla and Helena! How incredible are our party pieces?! 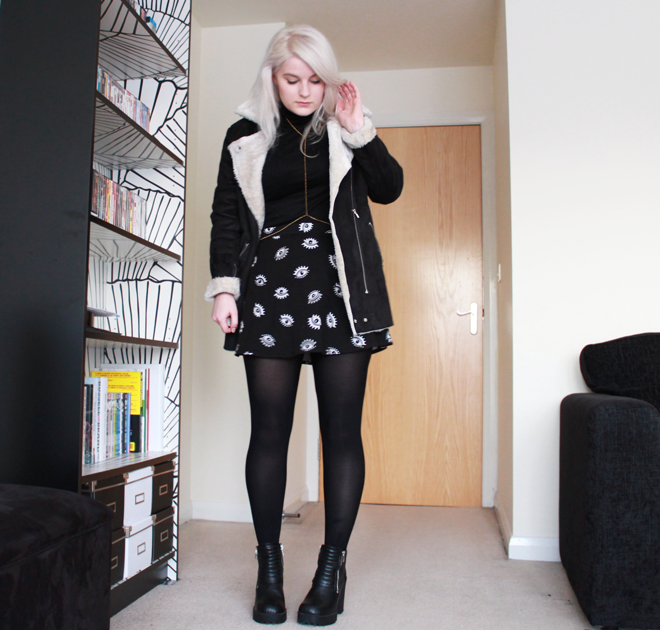 I'll be featuring this rather fabulous bomber jacket that I styled on my blog very, very soon! It's an awesome dupe for the Isabel Marant for H&M jacket, but instead in gold. Hope you're all liking this new design by the way! Re-vamped it to make it a bit more grown up. Ohh-e! I'm loving your new blog design! Gorgeous coat, looks so warm. 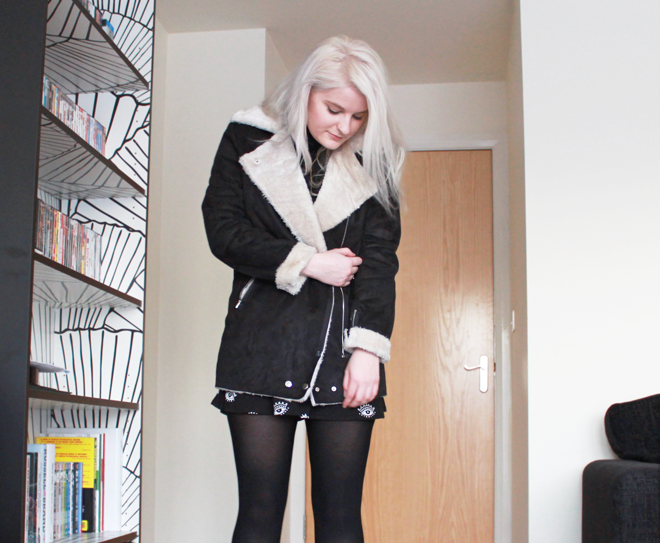 I have a fur lined parka from Zara and it's become my second home, so cosy and definitely necessary for winter. I have those boots from H&M and do you not find they're so painful to walk in? I feel like it might just be me. Great new blog design and very exciting to be featured on ASOS! Oh my that coat really does look warm! That coat is amazing, love the bodychain too! Such a nice coat, I've seen it on a few people and now I think I need one too! And I love that skirt, super cool. You look great! love the jacket and skirt. I ordered this coat today but was a little unsure of how it would look on - you look amazing in it and now I can't wait 'til it arrives! Fave look of yours ever, you look incredible!